Do your photographs seem to look quite different from the original scenes you saw with your naked eye? That might be because you did not use a proper photo filter. Most professional photographers that making an image look as close as possible to reality requires the use of one or more photo filters. But don't worry, batch photo filter adjustments can now be made in only a few seconds using reaConverter's powerful images editing tool. Load one or more images you intend to correct. 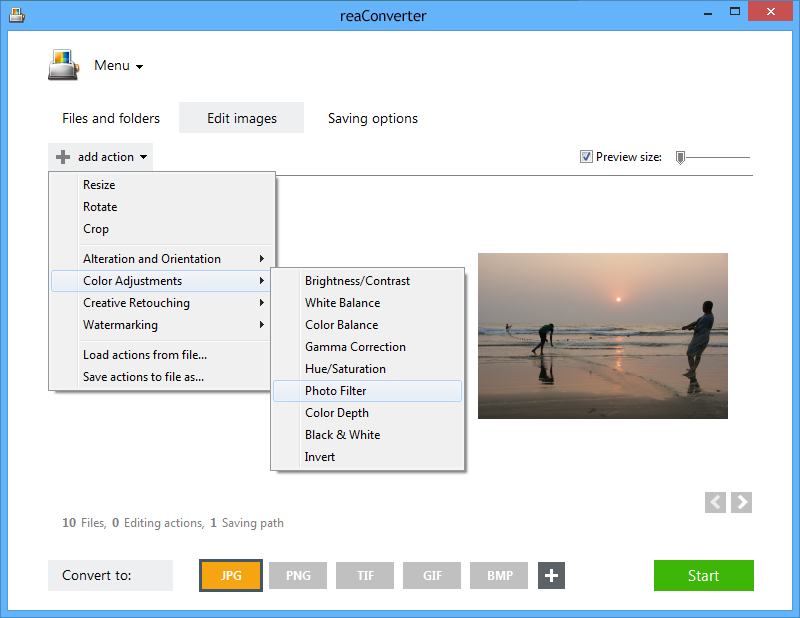 Use reaConverter's handy drag-and-drop tool, add them one by one or add entire folders. Here you can pick one of the various filters available for improving your images, including warming, cooling and specific color filters. The real time effect of your chosen filter can be seen in the Preview section, and you can customize its intensity or dominating color. Adding a photo filter can provide a major change to your images, changing their depth and atmosphere entirely. Click on the Saving options tab and pick a location for your newly edited images. Here you will find a convenient set of buttons helping your quickly opt for saving in the same folder where the images were initially stored, or in a customizable new one. 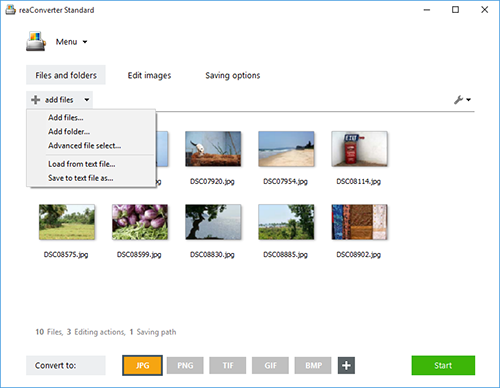 Saving directly online is also an option, if you prefer to keep your images in your Google drive, Dropbox, Box.net or SkyDrive account. Before completing the editing process, decide if you want to change the format of your images or preserve the initial one. A wide range of extensions is available to choose from. Pick one and press the Start button — your new images will soon be ready! 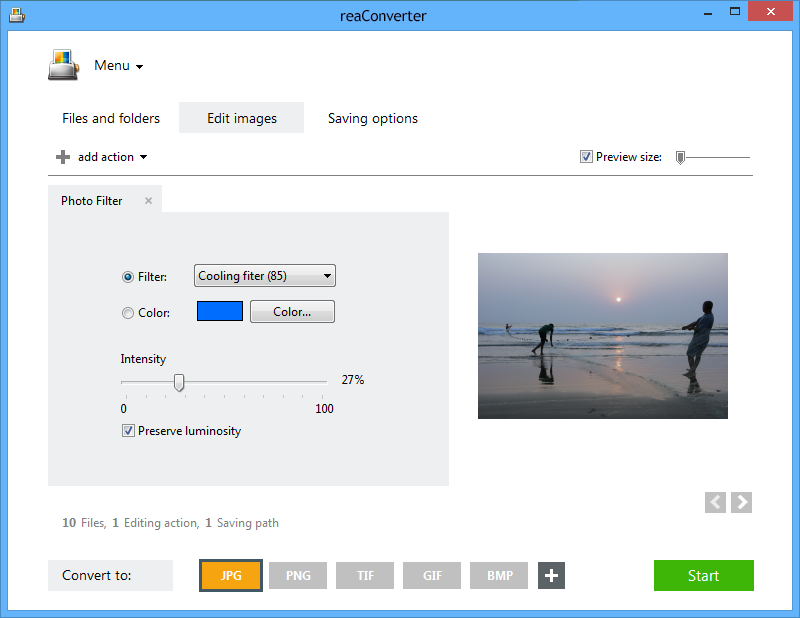 Command-line photo filter tool is an advanced feature meant for professional use, and is available in Pro edition only.